Since the Boston Sausage & Pepper Grinders are made with Italian Sausage, I wanted to carry that Italian vibe home. 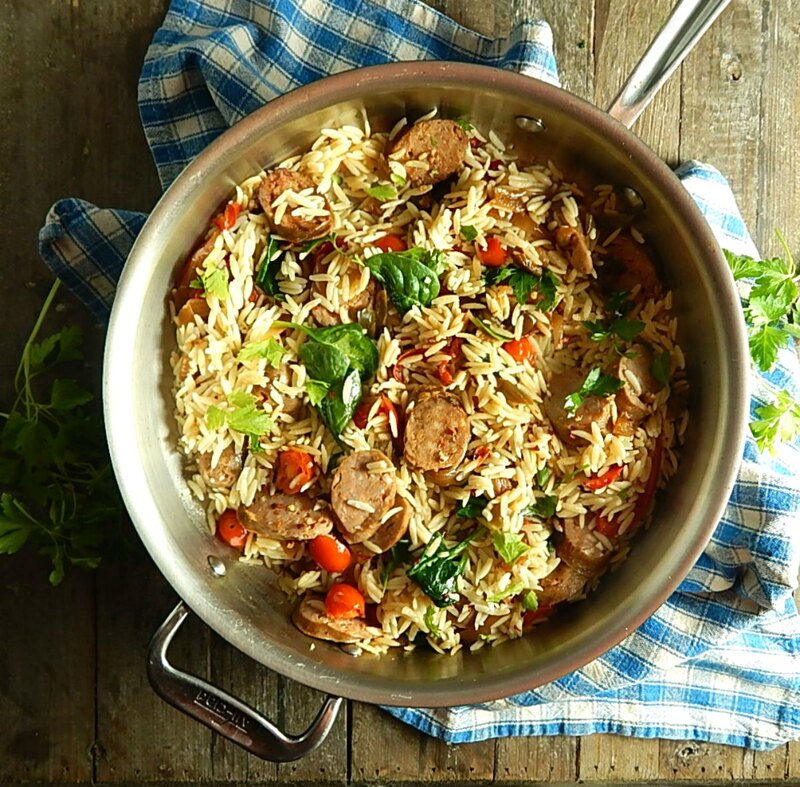 I raided the fridge and the pantry, so think of Orzo with Sausage & Peppers as kind of guide. Keep a dish like this in mind anytime you might have some kind of link sausage lying around; I’d suggest customizing to match the flavors of the country of origin. Bratwurst, maybe, with potatoes instead of pasta, maybe a little cheese? Polish sausage with cabbage; that would be a great low carb dish. A Greek or Turkish sausage (if you’re lucky enough to get a hold of them) with rice. You get the idea! I think you’re gonna love Orzo with Sausage & Peppers; it reads as fun, it’s fast it’s actually kind of pretty, and if ya don’t mind a little pasta, it’s pretty healthy. Well, I guess no-one can claim “healthy” these days. Everyone has their own opinions, and they might not include sausage, either. Or peppers and tomatoes, which are nightshades or oil which is objectionable to some when heated. Forget I said it’s healthy, just eat the spinach, lol. Seriously just eat Orzo with Sausage & Peppers coz it’s good! Ya gotta love a simple, mostly skillet meal that’s tossed together literally in the time it takes a little pasta to cook! And a dish that clears your fridge of a few bits of this and that and uses what’s in your pantry. I love making my Italian Wedding Soup, so I’m always looking for a way to use the rest of the Orzo, which can be challenging sometimes to find recipes for – and if you don’t care for Orzo, this will be just as good with just about any pasta you can think of. I tossed in a few cherry tomatoes that were looking a bit wrinkly, a partial bag of spinach that needed to be used, and meant to toss in a few black olives (my son left them here after a taco night at his work) and a little Feta cheese. I even had both on my counter and spaced adding them – it was still great! And when I had leftovers (see, even my leftovers have leftovers, lol) I added them, so it was a nice little changeup. Whole tomatoes, chunked, canned tomatoes, kale, chard or another green, mushrooms, roasted red peppers, even a little cabbage or summer squash and/or zucchini could all go in this dish. If you have no leftovers to make this dish? Well, just cook up the Italian sausage and bell pepper mix, following the recipe for the Boston Sausage and Pepper Grinders. It will go a little quicker if you slice the sausage first, saute it and remove it from the pan before you make the peppers. Then in go the tomatoes which makes just a bit of juice as they cook down and after a few minutes, the garlic, a few red pepper flakes *yes! * and any remaining peppers and onions from that sausage dish, along with any accumulated juices. Last is the spinach, heated just enough to begin to wilt. The spinach will get a lot more wilty when tossed with the warm orzo. Watch the orzo and don’t overcook it, rinse if needed, but keep a bit of the pasta water to moisten the dish if it seems dry. Top your Orzo with Sausage & Peppers with any fresh herbs you have; I used parsley, basil would be even better. Toss with chopped olives and Feta or another if you have something on hand. If you want to add any other veggies, and need to cook them through, add them in before the tomatoes, just to nicely soften, then proceed with the recipe. Of course, any recipe that utilizes leftovers is bound to be money saving, especially a recipe like this that can use bits of this and that from the fridge and/or the pantry; that being said, there are a few ways to fabulously frugalize this recipe even more. You can get by with only one sausage or use more pasta to stretch this. Whole tomatoes are usually a lot cheaper than cherry tomatoes and in the winter, use a canned tomato if you’d like. Freeze the rest of the can for another recipe. Orzo just seems to me to be perfect for the recipe; it’s small enough to absorb the flavors and I’m always looking to finish partial boxes. Another pasta might very well be less expensive; the more common pasta seems to go on sale more often. Just make sure your mixture is flavorful enough for a bulkier pasta; you might want to add just a little hit of chicken broth instead of pasta water or a touch of base or a few dried herbs, maybe my Italian Seasoning blend? I bring my herbs in every year and every year by the time spring rolls around, all I’m left with is parsley and chives! Don’t buy fresh herbs at the grocery if you’re on a budget; depending on the time of year you might even find starter plants there (they’ll be cheaper at a nursery in Mother’s Day or Memorial Day sale) but they’re usually a lot cheaper than bunches of herbs or those little packets that have a smidge of any given herb. Those were on sale for two for four at our store! Yikes! Yanno, even if you kill off your herbs, you can still dry and use them. Heat one tablespoon oil in a large skillet. Slice the cooked Italian sausage and add to the skillet, turning as necessary until warmed through and browned in places. Remove from skillet and keep warm. Add the remaining olive oil and tomatoes, cook until starting to soften, then add the garlic, red pepper flakes and the remaining peppers and onions along with any juices, cooking for a minute or two longer. Add spinach and cook until slightly wilted, tossing, then the cooked orzo and the Italian sausage, tossing together. Add a little of the reserved pasta water to moisten, if needed. Taste and add salt and pepper to taste; it may need quite a bit of salt, but keep in mind if cheese and/or olives are used, both can be salty. Garnish with chopped parsley or basil, cheese of choice and chopped olives. This entry was posted in Click here for Bargain Meals, Click here for Fabulous Food Posts and tagged Bargain Meal of the Week, Bell Peppers, canned tomatoes, Cheese, Cherry Tomatoes, Feta, Italian, Italian sausage, Olives, orzo, Pasta, Pork, Sausage, Spinach, Tomatoes. Bookmark the permalink. Don’t you just love it when you look in the fridge and make something that looks as fantastic as your orzo sausage and pepper dish from what you thought was nothing. Well done Mollie. I am newly obsessed with Orzo! It’s like pasta and rice found a perfect combination. Excited to try this recipe! I love it! I especially love orzo in rice pilafs, but haven’t done that for ages! I might have to get busy and do that! I’ll have to give orzo a try when my current long grain rice runs out. Thank you for the idea. I just got a six pound package of rice; the big package was so much cheaper per pound…and now I’m thinking, boy that’s a lot of rice for me! Love what you did hear. Brilliant.